The year 1957 was not only a great year at BY High but also a great year for the American automobile, as noted in this New York Times article. I think the Class of 1957 would enjoy reading this article as a reminder of the cars we used to drive (at least DeRay Norton and his 1957 Chevy), or dream of owning. Each age is a dream that is dying, or one that is coming to birth,” the poet Arthur O’Shaughnessy wrote. The year 1957 was just such a time. Humphrey Bogart, Laura Ingalls Wilder, Joseph P. McCarthy, Eliot Ness and Louis B. Mayer died that year. Significant 1957 births included Donny Osmond, Katie Couric, Scott Adams, Bill Ford and Osama bin Laden. The future seemed limitless for the United States. Postwar prosperity seemed as though it could go on forever, and Detroit automakers introduced a lineup of new models that seemed as invincible as America. “I think 1957 was a high-water mark for Ford design; Chrysler as well,” said Greg Wallace, manager of General Motors’ Heritage Center in Sterling Heights, Michigan. It was a Golden Era, but a fleeting one. It would end before the year was out. Fifty years ago, things were very different for the now-beleaguered Ford Motor Company. Ford’s 1957 lineup was all new for the first time in five years. The 21 models included a restyled Thunderbird sports car, a new generation of F-100 pickups, the car-based Ranchero pickup and the Fairlane 500 Skyliner — the first American convertible with a retractable hardtop. Sales were way up — so much that Ford outsold Chevrolet for the first time since 1935. Together, Ford and Chevrolet accounted for fully half of American car production. The public viewed the Chevys and their General Motors siblings as somewhat dowdy compared with competing 1957 cars. Critics derided the G.M. designs as passé because they were essentially makeovers of the 1955-56 models, with high rooflines, voluptuous fenders, short wheelbases and stubby overall lengths — the shoebox look favored by G.M.’s styling czar, Harley J. Earl. The future had already arrived at Chrysler. “Suddenly it’s 1960!” declared ads for Plymouth, which displaced Buick as America’s third-best-selling line of cars. New models advertised in Chrysler’s Forward Look campaign that were designed by Virgil Exner, the automaker’s chief designer, were trumpeted as “three years ahead of their time.” They essentially were. Chrysler’s president, Tex Colbert, was smarting from poor sales of the company’s 1956 lineup when he came across the futuristic advance designs for 1959 and ’60 models that Exner was working on. Eager for a fresh start, Colbert reportedly told Exner, “Let’s build those” for 1957. The ’57 models that had been in the works were scrapped. The 1957 Plymouth, Dodge, De Soto and Chrysler models trumped everything else on the market. For starters, they were five inches lower than the previous year’s models. They were also wider. Advertising claims (“longer, lower, wider”) notwithstanding, they weren’t really longer than the ’56s, but the sleek models looked as if they were. Credit the fins. Exner’s ’57 designs featured massive steel wings that seemed ready to propel these two-ton creations into the stratosphere. But of greater importance were landmark mechanical innovations like torsion-bar front suspensions, highly reliable three-speed Torqueflite automatic transmissions and Hemi V-8 engines that were power-rich yet fairly economical. By comparison, Ford’s 312-cubic-inch V-8 made only 245 horsepower, although an optional supercharged version produced 300. The small-block Chevrolet V-8 had its displacement increased to 283 cubic inches, but base horsepower was just 185. However, for the first time on an American production car, fuel injection was offered. That helped to raise horsepower to 283 — the first time an American manufacturer had been able to achieve one horsepower for each cubic inch of displacement, the company said. But the fuel injection system was touchy, and dealers didn’t know how to work on it. Many dealers replaced the system with a carburetor. The supercharged Ford 312 was gone after just one year. The Forward Look cars were also unreliable. They tended to rust quickly and completely. Tire wear could be extreme. The most desirable models were also relatively expensive. The 300C’s price was $4,929 ($5,359 for the convertible) — about $2,000 more than Ford’s top-line Skyliner. Even the Skyliner would prove too expensive. In its debut year it was not a huge seller; it would struggle through two more years of ever-declining sales before being discontinued. 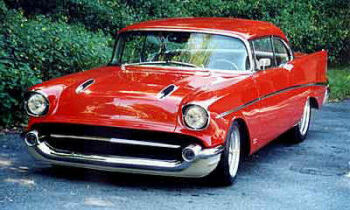 The ’57 Ranchero (I have one in my garage) would prove far more enduring, helped by its $1,920 price tag. In excellent condition, a ’57 Ranchero today is worth 10 times its original price. 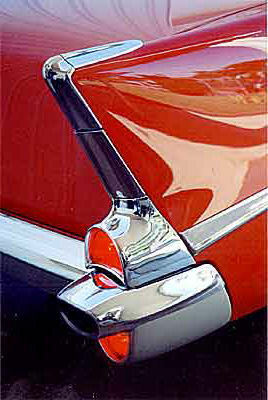 Though the 1957 Chevrolets lost the sales battle, they would win the war. “Chevys were so well built they literally outlasted the ’57 Fords and Plymouths,” Mr. Godshall wrote. The longevity of the Chevrolets means that more of them have survived — by some estimates, up to 10 percent of the 1.5 million sold — but their values continue to rise despite their numbers. 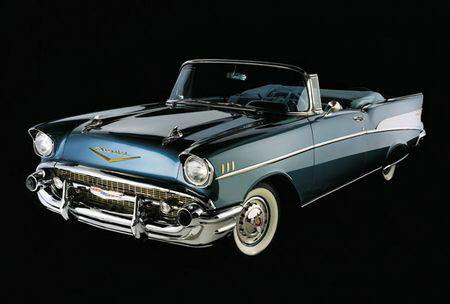 Kelley Blue Book reports that a pristine Bel Air convertible valued at $82,600 is still going up nearly 30 percent a year. But the scarcity of Chryslers, of which possibly less than 1 percent of the 122,273 sold survive, has helped increase values: a 300C convertible jumped from $92,400 in 2006 to $154,580 this year. Ford values, with a few exceptions, have remained flat. A ’57 Skyliner is worth about $53,700, close to its value a year ago. Given the longer perspective of history, the designs of 1957 seem to have never gone out of style. Never before had form so completely triumphed over function. 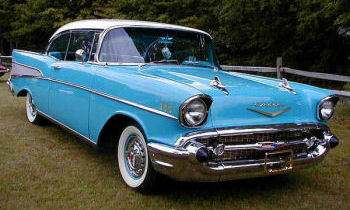 Still, by the end of the ’57 model year, their novelty had worn off, and a deep recession depressed sales of 1958 models. “Indeed, part of the reason 1957 looks so good to us now, is because 1958 was so bad” Dan Lyons wrote in his book “Cars of 1957” (Publications International, 1997). Not insignificantly, in the final weeks of 1957 at least three major world events would shake American confidence: The Russians successfully launched Sputnik; an American effort to put a satellite in orbit blew up on national television as it left the launch pad; and President Eisenhower had a mild stroke. Small, economical cars were making a statement; the Volkswagen Beetle and Renault Dauphine were selling well. In 1957, sales of foreign makes in the United States topped one million for the first time. Within three years Detroit would counter with small cars of its own: the Chevrolet Corvair, Plymouth Valiant and Ford Falcon. Function began to throttle form. Also that year, a little-noticed Japanese automaker struggled to survive its inauspicious debut in the United States. The company’s premier model was an unreliable little sedan called the Toyopet. Just 288 were sold. The company’s name: Toyota. Click 1957 Chevy fin for audio slide show.